Watches--the new timepiece collections started back in the early 1900s as wristwatches, which replaced fob or pocket ones as the preferred timepieces for fashionable gentlemen. The first designers of the Swiss timekeepers were the Swiss firm Girard-Perregaux and the french jeweler Louis Cartier. Girard-Perregaux made timepieces for the German navy and Cartier made one for the pioneer aviator Alberto Santos-Dumont. Patek Philippe & Cie was founded in 1839 in Geneva, Switzerland. 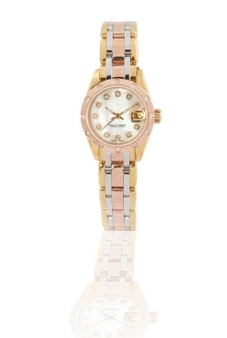 It is well known for its high quality timepieces worn by royalty, film stars and tycoons. Patek Philippe & Cie's most expensive timepieces ever made were complicated and were made for Charles Packard of Warren, Ohio and Henry Graves, Jr. of New York, two multimillionaire collectors. Their complicated product work functions started in 1928 and were made in five years. This complicated watch was in a recent auction at Sotheby's and it sold for $11 million. For the sell of a watch or clock that was the highest price ever. In World War II, timepieces were desirable and Patek Philippe rosed to the occasion to produce a range of models designed for commercial purposes. They named these models, Calatrava after the Spanish religious order, who were the protectors of the citadel of Calatrava from Arab invaders. The Calatrava cross was used on these timepieces and Patek Philippe later adopted this cross as the symbol for their company, which now appears on their products. In 1989, Patek Philippe celebrated their 150th Anniversary by producing the Calibre 89 limited editions including three example yellow gold timepieces with 33 functions and were sold for $2 million. In the 1910s, more designs came out as other firms mass produced their own brands. Longines and Ebel were among these firms. They responded to the demand for military timepieces in World War I, producing these military watches with protective grilles to cover the face hand, luminous hands and dials. The famous Omega was one of the first, that was industrially produced in 1900. Omega was founded as an assembly workshop in 1848, during World War II, a large number of timepieces were produced by the company for British military officers and airmen. The Seamaster, a new post-war designed watch (worn in recent films by James Bond), and the Constellation were made for strength and accuracy, which were greatly influenced by the requirements of the war. Omega's two post-war watches were originally self-winding bumper automatics. A range of these 360 degrees full rotor, winding automatic movements were introduced by the company in 1956. They created the Speedmaster in 1957. The Omega was chosen by NASA in 1965 as their official timepiece and it was the first one on the moon. In the 1960s, Omega had become the number one brand to own. They often produced the same model in 18ct, 14ct, or 9ct gold watches covering all price points. Omega was chosen as the official timepieces for the Olympics, including both the 2008 Summer and 2010 Winter Olympics, they are now recognized and is the most respected watch houses in the world. Wristwatches were developed during World War I for easy reading while struggling through muddy trenches and no-man's land. 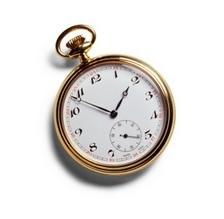 Some of these timepieces were designed as traditional half-hunter pocket watches. These were timepieces where the outer cover had an enamelled dial and central glass aperture through which the hands could read. They had additional lugs threaded onto a wrist strap. They were difficult to read, fore, the dials did not face the owners who were wearing them. This problem called for the Swiss and American makers to step-up and address the need to make Trench-styled pieces. Metal grilles were added to them to protect the faces. Luminous hands and faces were also made for easy reading in the dark. In 1917, the Cartier Tank Watch was designed based from the British tanks which were introduced to the battlefield in 1916. They are collector's items today. Since this timepiece began in the early 1900s, makers, many of them famous, have sprung-up to design timepieces for many important events that'll last for centuries to come. Starting in the 1920s, these makers began to design them for the public. The war was over and the makers designed their products which followed styles from architecture to clothes from the influenced of the Art Deco. In 1924, these timepieces had conquered the world, everyone were wearing them, the people of the middle classes, working women as well as the ladies of society. 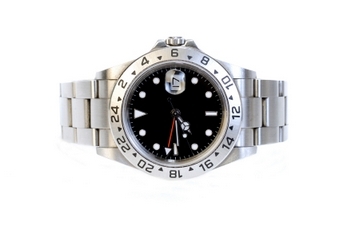 The largest luxury timepiece that came on the scene producing 2,000 of them per day was Rolex. Founded in London in 1903, the company was originally known as Wilsdorf & Davis, the name changed to Rolex in 1915, after their product was trademarked 'Rolex' in 1908. Rolex became the designer for the popular diving sports in 1959 with their famous timepiece, the Submariner. The Submariner was designed to measure time under water. The Rolex company designed waterproof Oyster case in 1927 after entering the automatic timepiece market upon Harwood, an automatic timepiece maker since 1922, went bankrupted. In the 1930s, Rolex designed another automatic type, a silent 360 degrees self-winding movement with a very large motor that doomed the case backs, which later became known as the 'Bubble Backs' and were launched in 1934. In the 1930s, the popularity of the timepiece continued to grow up to the time of World War II. The Art Deco became the main manufactured style for that period. The Jaeger-LeCoultre Reverso was designed for sportsmen in that time period. The 1940s became the period where larger and more masculine watches were designed with new technology such as a perpetual calendar and an alarm built inside the wristwatches. Ventura, the world's first electric, battery-powered timepieces were introduced by the Hamilton Company in 1957. Elvis Presley wore the Ventura in the movie, 'Blue Hawaii' in 1961 and it was also worn more recently by Will Smith in the movie, 'Men In Black'. Hamilton Company was founded in Lancaster, Pennsylvania in 1892. It is the firm that has produced high quality timepieces for the military, industries (such as the railway companies), and created the first digital watch in the world that could measure time at 12.01 New York time on May 6, 1970. The 1950s is when a sense of optimism was felt around the world about the timepiece, but, was less apparent in the industry where the prices for these products remained high. Many people wanted to own one, but, only the well-heeled could afford it. The 1960s to 2000s were the years where larger models were designed for both men and women. Piaget was the firm that designed timepieces with set dials made of colored stones and diamonds. In the 1960s, Patek Philippe went all out to design their products with asymmetrical faces, while the Swiss and Japanese continued to develop battery-powered ones. In the 1970s, timepieces were produced bulky with latest liquid crystal displays or light-emitting diodes, this was the new quartz movement. Comfortable and stylish types were soon designed by fashion houses such as Chanel and Dior to answer the demand of the public at that time. From the 1980s to 2000s, timepieces became more fashionable for both collectors, celebrities and the public. Swatches were made to appeal to the younger generation and the young-at-heart. 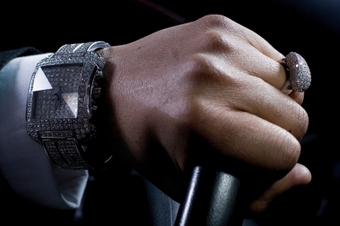 Tissot's Rock and Corum's Meteorite both made from a piece of Swiss granite, were novel or unusual designs, stimulanted the industry throughout the 1980's. The makers designed mechanical, more complicated and unusual model timepieces for collectors in the 1990's and by the 2000's, these products were seen as luxurious and fashionable. 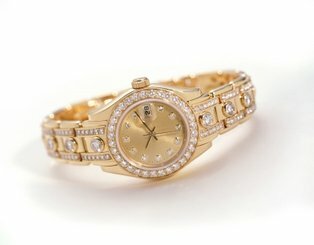 Today these timepieces are seen as fashion accessories and no longer instruments for telling time, this has increased sales for high-end watches. Switzerland continues to be the largest manufacturers of timepieces due to the high quality of their work.